Like Spring, Riverton's Little House is Starting to Bloom! It seems that Riverton's Little House That Could has a fan base. 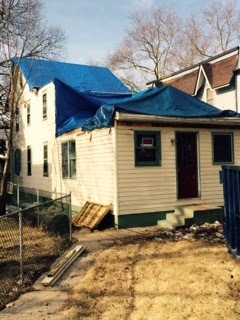 I have received several emails and texts requesting updates on our favorite renovation project and I can report that the initial progress had been slowed by paperwork and permits. But now, FINALLY, this weather and age beaten house is starting to get a major overhaul! Fascinating information came forth after our first Facebook posting of this house. There were questions about age and ownership and it became so interesting when people who were familiar with the house started chiming in! We learned from neighboring Cinnaminson resident Matt Gideon that "It might have been Louis Corners house where fire was stopped. He was a plumber and a member of Independence Hook and Ladder Co of Riverton and Palmyra. I have no idea how far down the block the fire got before being controlled. The home should be about 125 years old as you say. About 2/3 of the block was destroyed by fire late at night January 11, 1890." Matt continued, "The fire was started by an arsonist who set fire to the stables in the rear of Robert's General Store located at Main and Howard Streets. The fire destroyed the General Store and stables then headed down Main Street. It destroyed the dwelling and barbershop of William Wolfschmidt and then the home of Rebecca Faunce. The fire was finally stopped at Louis Corners home but not before the home was heavily damaged." Blackened rafters in the attic may support some of what Matt was explaining. As stated before, a major roof collapse from a heavy snow load in the past few years, definitely added to the damaged condition of the roof supports. Then, it became very exciting to hear from John and Mary Hartnett who had some real residential connection to the home. 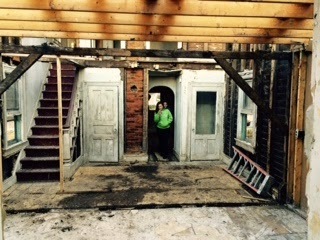 "We are beyond happy to see that our old home will soon be restored!! My husband moved there in 1957 when he was two. We sold the house in 1989 after our second child was born. We still live in town, so it was hard to see the house in such disrepair." John added, "I have set of plans for a second floor addition. They're for a new master bedroom and bath and to make it a true 3 bedroom house. They were drawn up in 1988". Now, 27 years later, new plans for a master bedroom with an en suite are in the design plans of the current owners! So...where do things stand now? Apparently, just kicking into gear! Kitchen walls have been removed to reveal some of the design plans for that open concept that is so popular! Older homes are divided by so many walls, that it seems builders believed the more rooms they could fit into a house, the better. Not so anymore. We are drawn to the freedom of unrestricted sight! This house will reflect that! 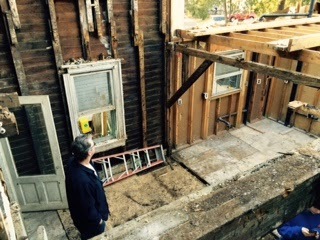 Owner, Tom Kilroy looks on as the back of the house has been removed in preparation to install new support for that master suite and bath. More tarp! 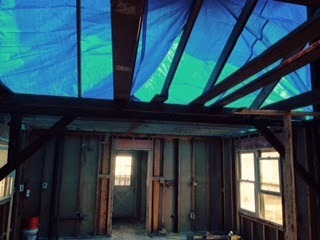 With the top of the house removed, Heavy blue plastic sheeting protects the exposed support rafters! So far...so good! Still waiting for PSE&G to connect electric to the house has meant that recharging tool batteries for owner/contractor Mike Vogal has been a little bit of a challenge. But that should change soon! Sawing, drilling, hammering, and full blown renovation will soon take course once there is electricity, so stay along for the ride! Updates will be posted when changes are made. And this little house, in the little town of Riverton, will become a home...a decent size home at that, very soon! Easter Deviled Eggs? Think Outside the Shell! It's Easter and it's time to make the eggs! This is a repost of a heavily downloaded blog. And, I will be making my version of a deviled egg! This may seem like an odd food subject for someone who is allergic to egg yolks. 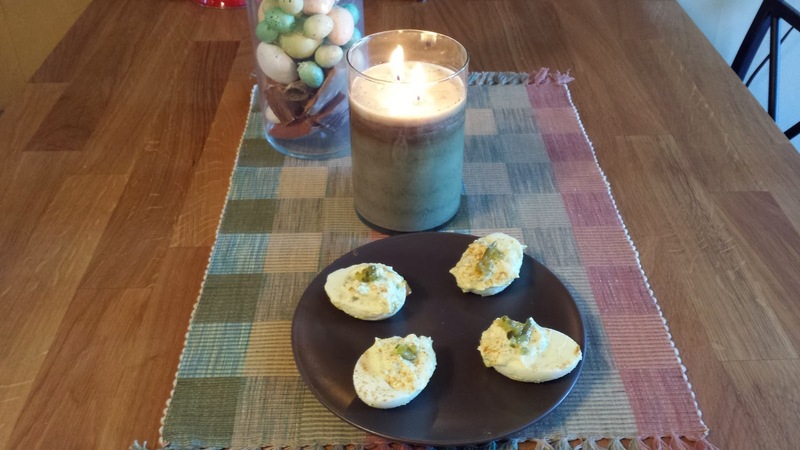 But, deviled eggs seem to be a staple on the Easter dinner table (at least in my family), and were truly one of my favorite things, And until this morning, I could only eat a deviled egg if I wanted it with a side of anaphylatic shock. But we'll get to that later. Everyone has their way of making great deviled eggs with most recipes family specific and past down through generations. The classic way of boiling eggs, scooping out the yolks and mashing then with mayo, mustard and sweet relish, is pretty much the standard in most households. But if you really think about it, the classic mixture is a wide open canvas to which so many other wonderful ingredients can be added. Now, I don't remember my late ex mother in-law as being a great cook, (she was a working woman who was great at ordering out - had that down to a science) but she did devil her own eggs, and always added horseradish to her egg mixture, and her family raved about them. At the time, I was not very adventurous when it came to adding heat to a recipe, so I never tried them. Now, my aging pallet cries out for a little kick to wake it up, and I gladly would sample one...if she were still here, if I were still married and if it didn't kill me. That being said, I explored several options on the deviled egg front and found some wonderful ideas! But first let me tell you why I can now join the party when it comes to eating an item where the major flavor component is an egg yolk. At first, as much as I tried, I could not think of anything that matched the rich creaminess of that deep yellow yolk. According to my allergist, 97% of people who have egg allergies are allergic to the whites. That is a tough one. I, being in the other 3%, can a least eat egg white omelets, or even Egg Beaters. Therefore, no complaints here! So there are really not a lot of suggestions out there for someone in my predicament who is just aching for a deviled egg. There was one site that suggested mashing up some hard boiled egg whites with the mayo, mustard and relish, and I did. But to be honest, it lacked the creaminess and taste that yolks provide. So, as I usually do on a Sunday morning, I started to make a Bloody Mary, which I believe always helps my thought process. And as I was reaching into the refrigerator for a jar of olives...there was my answer!!! Hiding behind the olives was a bar of cream cheese!!!! If I blended cream cheese into the boiled white egg mixture, I would have the rich creamy texture that is mandatory in making great deviled eggs! I just knew a Bloody Mary would help! It worked perfectly! In a food processor, I blended about 3 ounces of cream cheese, four cooked egg whites, relish, both wet and dry mustard, and the mayonnaise, until it looked about right! Sprinkled in a little sea salt and tasted. It was as close to a regular deviled egg as I've had in 15 years. It was so good, I was actually a little afraid to eat it! After boiling the eggs, I very carefully scooped and discarded the yolk, then washed and lightly dried the remaining egg white. Maybe my excitement made my slightly delusional, but I was pretty sure I liked this version better! So if you don't care for deviled eggs, but love cream cheese, try making them this way! Okay, now that we've mastered the egg, let's get to some of the variations I discovered in my search. 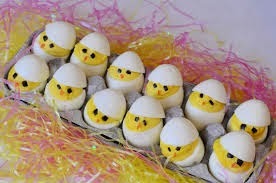 First, is the one I am going to make this Easter! If you have the desire...and the time, this is really cute! Blend the cooked yolks with 1/2 cup of mayo, 1 tablespoon (or more according to taste) of creamy horseradish. Then add 1 teaspoon of Dijon mustard. Mix in 2 tablespoons of chopped chive. Season to taste then fill the egg whites. Hummus Eggs! (A friend made this and they went quickly. I obviously couldn't eat them but will definitely try it now!) Blend the cooked yolks with 1/2 cup of hummus, 1/4 cup of plain yogurt and juice of half a lemon. Season to taste and fill into egg whites. ( You can stop here and sprinkle with crushed pita bread, or...) Heat 2 tablespoons of extra virgin olive oil and a 1 tablespoon of chopped of Kalamata olives and a sprinkle of red pepper flakes. 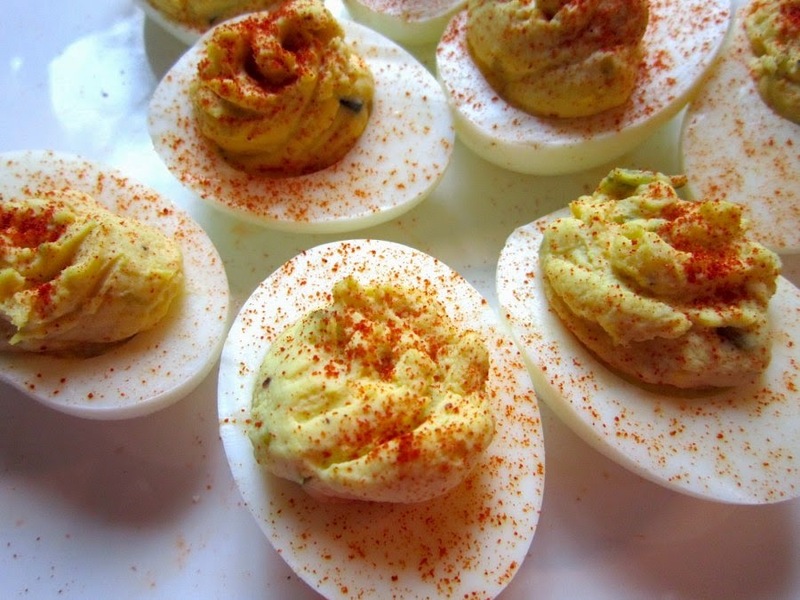 Drizzle this mixture of the deviled eggs. I can only imagine how good this will taste with cream cheese! Blend the cooked egg yolks with 1/2 cup mayo, 4 teaspoons of Wasabi paste. Spoon into egg shells and top with pickled ginger. Blend the cooked yolks with 1/4 of mayo and a 1/4 cup of shredded cheese. Season with a little salt and hot sauce! Brown, drain and crumble sausage and sprinkle on top! Great version for a slightly different breakfast entree! As you can see, the basic mixture of 12 egg yolks, 1/2 cup of mayo, 1 tablespoon of sweet relish and 2 teaspoons of Dijon style mustard, is just the beginning. What could be better than adding some cooked chopped bacon or ham? And since we are now mixing in cream cheese, how good would it be to add some smoked chopped salmon? I love Easter Dinner. There is nothing better than the waft of a roasting ham filling the house. And now, thanks to a desire, curiosity, and the need to add olives to my Sunday morning ritual, I can also enjoy another one of this holiday's favorites! Let me know how adventurous you can get! The 4th of July parade will pass right by this porch! There was a time when the scent of an Easter ham wafted through the rooms on a spring Sunday afternoon. A time when family gathered around the Thanksgiving table and kids in pajamas excitingly rambled down the wooden stairs on Christmas morning. There was a time when this 125 year old house was so much more the decaying structure it has become now...it was a home. A place where this historic township's 4th of July parade marched passed every summer while the family sat on the porch waving small American flags. And now, thanks to the vision of three local residents, it will once again regain its purpose. And if truth be told, Facebook had more than a little bit to do with this. But, let me go back a few weeks. My friend Lynnie was looking to downsize while hopefully staying in her hometown of Riverton. She enlisted the help of my sister, Betty Ann Shepard, a Realtor with Berkshire Hathaway, with a passion for older homes. If buying as is, be careful getting out of the tub! It should be noted that this small town was listed in Travel Magazine a few years back, as "One of the Best Small Towns to Celebrate the Fourth of July in". And it truly is. This lovely enclave of mostly Victorian style homes sits proudly along the Delaware River where it once served as a vacation destination for the Philadelphia wealthy and elite. Now, more often than not, houses are passed down through generations without ever hitting the real estate market. And it takes a little perseverance to find what you're looking for in Riverton. So early one February Saturday, the three of us, along with our friend Sandy, spent the afternoon roaming the town for that perfect possibility, when Betty suggested we stop at 505 Main Street to see a house that had just come on the market two days earlier at well below market valvue! But once we pulled onto the ice covered back drive, the reason(s) were apparent before we even got out of the car. First, and most obvious, was the blue tarp that covered what use to be a roof. We learned latter that a few years back, a heavy snow load had crashed through the weather battered shingles causing major destruction inside. We got out of the car to peek through the windows and were surprised to find that the interior walls were stripped to the studs by water from the collapse that damaged the drywall. This railing may be the only thing kept in this "gut job"
Broken pipes, knob and tube wiring, and tiles lifted from age and melting snow were strewn around the pitted and collapsing floor boards. A radiator expansion tank...what could this be turned into? Yellowed by age, wallpaper with dated patterns still hung in some of the closets. An odd site was to see a tub precariously hovering over some rotting second story floor boards. Not sure what happened to the sink or toilet. It became obvious that this place needed so much more than a renovation, it needed a resurrection! So, there it sat, a mere skeleton of its former self, seemingly crying out for love. And I loved it. It was so beaten down. A completely depressed appearance. When the winter wind lifted the tarp, the rustling sounds were like labored breathing. I took some pictures, and then, as I often do, posted the them on Facebook and joked around about buying and rescuing it with my drill and some paint. This, of course was a ridiculous notion, but several friends jumped on the fantasy bandwagon and offered donations. It was a fun afternoon of "what ifs". Then, I got a text. "Jo Ann, what is your sister's cell number?" from my real life and Facebook friend, Denise Kilroy who had been quietly watching the social media version of Rehab Addict. And that text threw a life raft around that house. I didn't know it at the time, but Denise, her husband Tom and contractor Mike Vogal, were forming an LLC to rescue, renovate and flip older abused housing. They made that call to Betty, and the rescue mission was on! New owners, much to discuss! 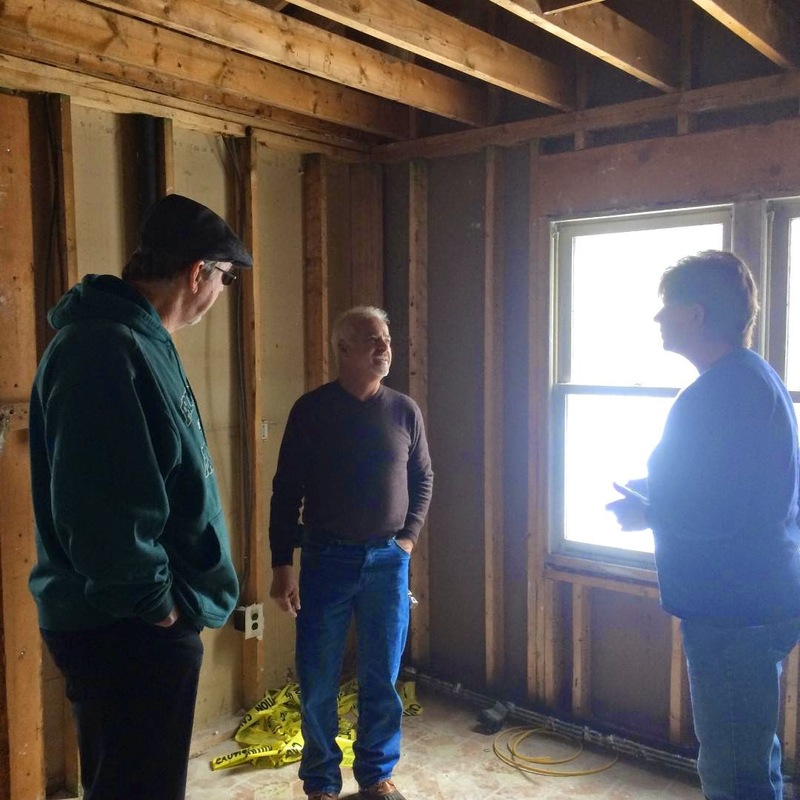 It will take much vision and skill to turn this dilapidated building back into a home, but listening to Denise, Tom and Mike on a recent visit, it quickly became apparent that this group has both...in abundance. Mike, who has worked on many older homes in Burlington County, will remove the studs separating small rooms, install beams where necessary, changing the flow to the ever popular open concept. A master bedroom with an en suite will be added and the kitchen will become some lucky cook's culinary dream. Updating will also mean that radiators will be removed and a new HVAC system installed. Up in the corner of a room (that had no floor) I spotted an old radiator expansion tank that just cries out to be re-purposed by someone with a eye for design! As the dialog about the possibilities swirled around me, all I could do was look around at the broken floors, rotting window sills, missing dry walls, and think "where do they even start?" But the important part is that they know that answer. And once all permits are secured. This resurrection will begin! And we can't let that happen without following the progress. With that in mind, a new blog, created by Betty and myself (with the blessing of the new 505 Main Street, LLC owners) will follow the journey of turning Riverton's little house that could, into the little house that is...a home once again. 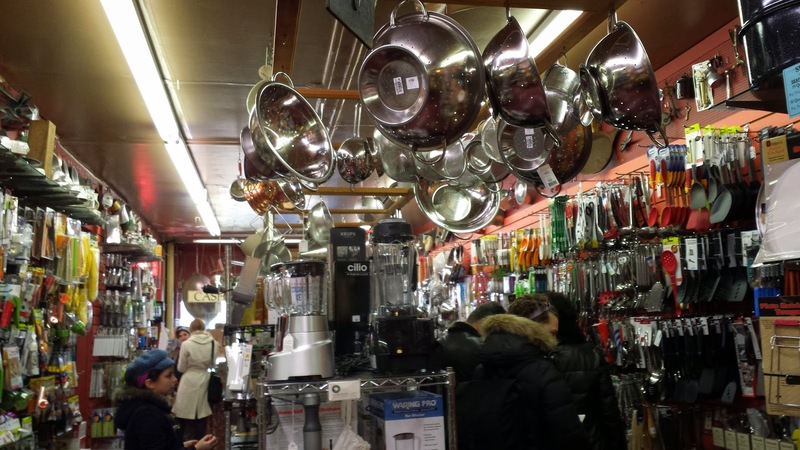 Soon, a link to the new renovation blog, "505 Main Street" will be posted on Kitchen Clatter, Facebook and Twitter. Stay with us for a true renovation fascination! Follow the soul of this house being brought back to life. And that can only happen when this gate swings open to welcome a new family! A Recipe From Aunt Lee's Cucina...Always a Challenge! Betty's Peppers stuffed with bread! Sometimes the best journeys begin with bridge fare! At least it does for me each time I travel into downtown Philadelphia. Or Philly, as it is known around here. And I do this as often as I can. Whether going to the Reading Terminal Farmers Market, or the 9th Street Italian Market, this town is my go to place when I need to escape into the past. And that is exactly what I did this past weekend. 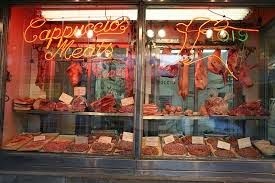 With my sister in tow, we headed to the Italian market and didn't leave until our hands were full! 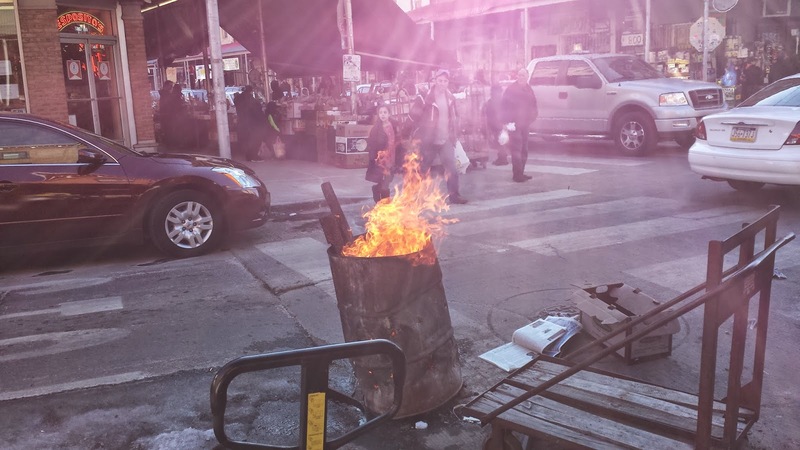 Anyway, as we strolled along the wooden tables, the wafting of burning pallets in iron barrels, stoked by vendors to keep warm, smelled and felt so good in temperatures below 20 degrees. I was amazed that in late February, there were containers of deep red cherries and (my personal summer favorite) nectarines in abundance. But what stopped me cold (pardon the pun) was the size of the sweet frying peppers. They were huge! 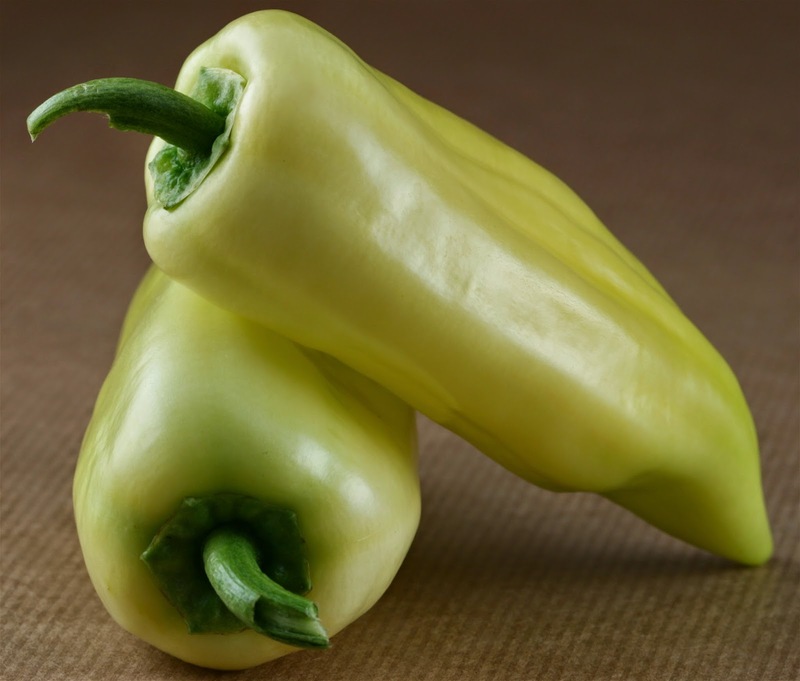 Perfect for one of my sister Betty's favorite recipes - peppers stuffed with bread crumbs and cheese! "Bet, look at these, they would be perfect for Aunt Lee's pepper recipe you make!" I wish you could have seen the expression on her face. But to appreciate it, you need to know that my Aunt was a good cook (although I think my Grandmother was better), who would always leave an ingredient or two out of any recipe she gave out. That way, her dishes were always the best. We called her on this several times. She denied it. "You either know how to cook or you don't" she would say. That was the case when Betty tried so hard to get this pepper recipe right. Directions: Mix all of the stuffing ingredients in a large bowl. Mixture should feel slightly wet. Pour a little of the olive oil in a frying pan, add the stuffing mix and saute slightly. Brush the outside of the peppers with olive oil.When cooled,stuff the peppers with the bread mixture. Top with cheese (again, optional) and bake at 450 degrees until the cheese is lightly browned, NOT burned. Ovens vary so just be sure to watch but it roughly takes around 20 minutes. Once removed from oven let stand for a few minutes. Note: This recipe is easily adaptable. 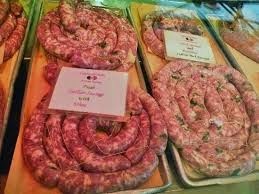 If you want to add olives or cooked, ground and drained Italian Sausage it would work well. Get inspired! Aunt Lee - "Well, how much olive oil did you put in the mixture?" Betty - "Olive oil? You didn't tell me to add any olive oil." 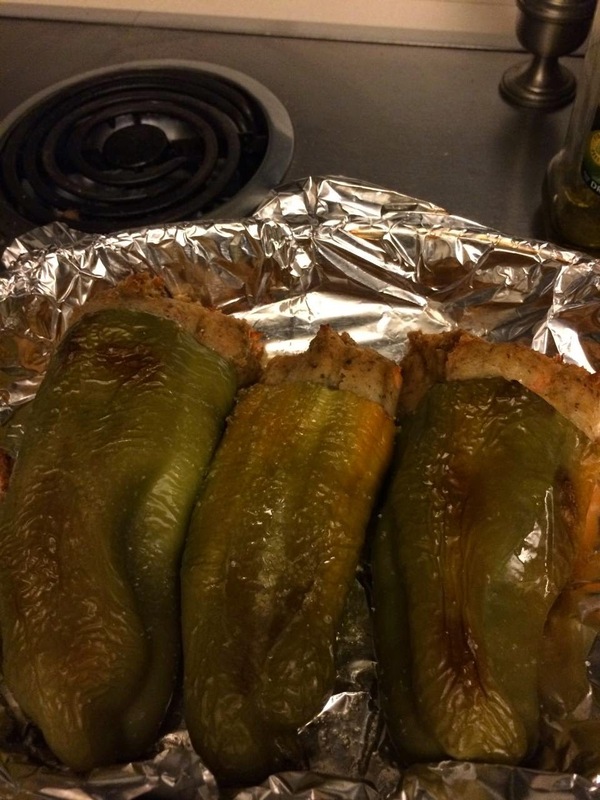 Betty - "Better, but the peppers still didn't cook completely right." Aunt Lee - "Well did you use some of the oil olive to brush the outside of the peppers before you baked them?" Betty - "No, you didn't tell me to do that." So you get the picture. It took my persistent sister several attempts to get this recipe they way she remembered my Grandmother making them when we were kids. With ingredients bought at the Italian Market I'm sure. And they are just as delicious! 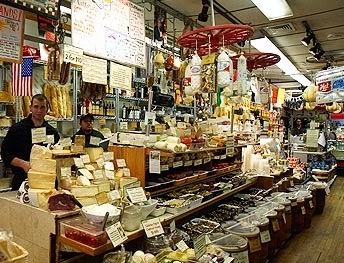 The 9th Street Italian Market makes you want to go home and cook! 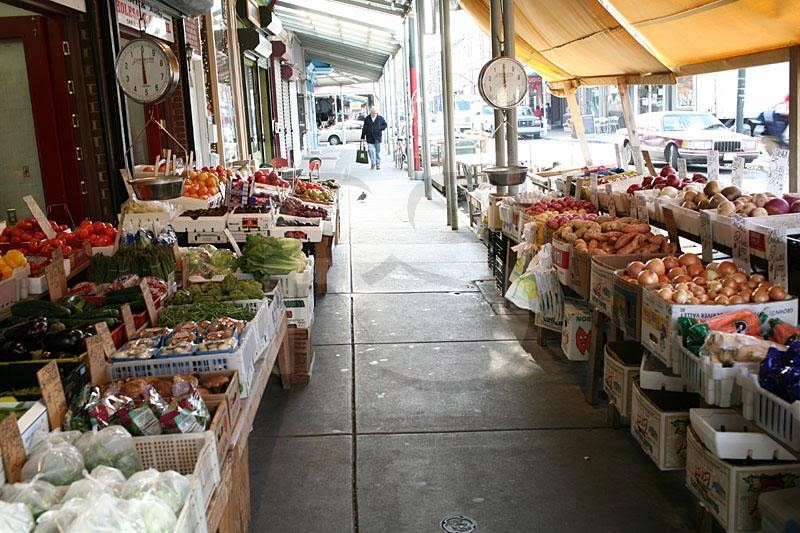 It brings out all of your culinary desires, all within just a few blocks! 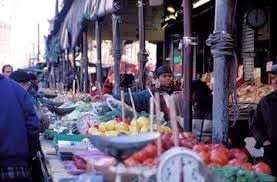 Take a stroll through the pictures below, and then plan a menu and hit the street...9th Street that is. You will not regret the bridge toll!